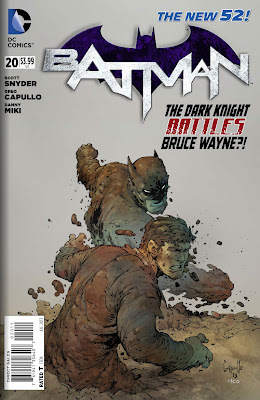 Batman #20 - "But as you well know, sometimes I'm my own worst enemy..."
Scott Snyder and Greg Capullo let loose with part two of their quick Clayface story this month, giving us a fast-paced and fun story and really making me remember why I love this book. 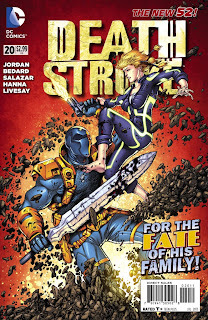 It's great to have this action-packed move after two huge multi-issue crossovers in a row. Plus Greg Capullo gets to have ALL SORTS of fun drawing the shape-shifting Clayface...there are so many fun textures and characters which he can become! The issue is well written, too, with a nice nod to the overall story of Bruce still being torn-up about the loss of his son Damian "Robin" Wayne, without making that the main focus of the story (as Batman's grief and rage are fully covered in TWO other Bat Comics, at least). It really makes me look forward to next month when we step into the past for a new arc that they are calling "Zero Year!" Oh I forgot to mention the Superman/Batman back-up feature of a haunted apartment slum also wraps up...it's a nice character study of both heroes and their interactions. Just like the main feature, it is very well done! I'm impressed! Superboy #20 - "When you take away the Super...all you're left with is a boy." 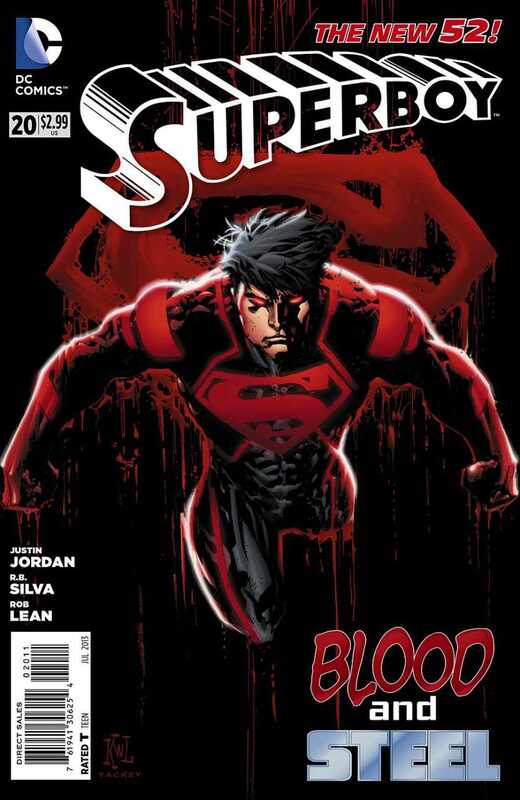 New writer Justin Jordan makes his debut on Superboy this issue, and I am immediately a fan! Superboy teams up with tiny bald psychic Dr. Psycho to try and take down a giant purple monster calling himself Dreadnought and his little alien-headed pal Psiphon. Both of these oddly proportioned chaps attack Superboy and Dr. Psycho, siphoning away his TK powers...literally weakening Superboy to make themselves stronger (explains that guy's name, too!). Both villains and ally are from a mysterious organization called the H.I.V.E., and there is clearly more going on than either we the readers or Superboy really understands. The main strength that new writer Jordan brings to this book is in the dialogue. Superboy has suddenly become witty; cocksure and likeable! I'm impressed. Oh that and he gives us a Krypto the Wonder Dog cameo. I love Krypto! The only thing that makes this issue suffer is that there are FOUR different artists! 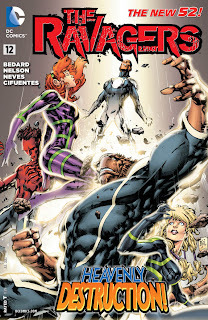 None are bad, and one is Ken Rocafort (aka REALLY GOOD!) but the transitions are awfully jarring. Here's hoping for a new regular artist next month! 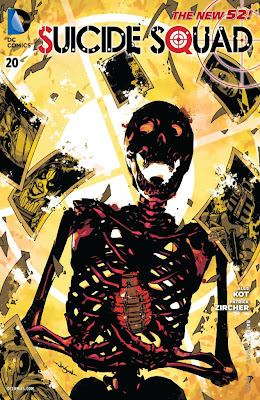 Suicide Squad #20 - "So...This is the day when everything changed..."
Speaking of new writers, Ales Kot of Image Comics fame takes over the Suicide Squad this month and immediately starts changing things around! He's dropping team members, adding new members, changing the direction and generally making the book his own! The entire book this month is narrated by a conversation between Amanda Waller and a mysterious, shady figure, as they psychoanalyze the character of each member of the Squad, teaching us a little more about who's on this team. 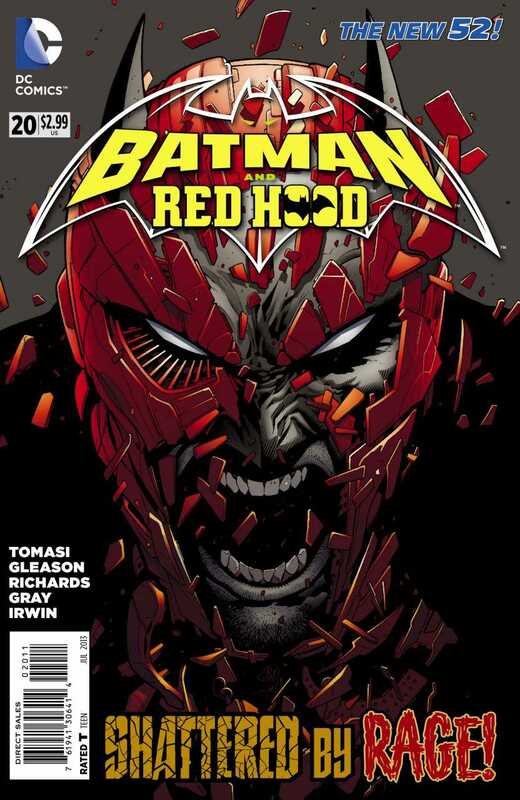 Batman and Red Hood #20 - "I want them out in the open first...so I can get up close and personal." In yet another excellent, powerful and emotional issue of Batman and Robin this month we explore the caped crusader's RAGE, in the second of five issues dealing with the five stages of grief. Each issue pairs Batman with a different partner to replace the deceased Damian Wayne aka Robin, the Boy Wonder. Former Robin Jason "Red Hood" Todd joins the dark knight this time out on a mission to Ethiopia to take down a cadre of assassins who had the gall to make an (failed) attempt on Robin's life some months back at the bequest of his mother, Talia Al Ghul. Justice League of America #3 - "Use it up and throw it in the trash...I guess that's the American Way." 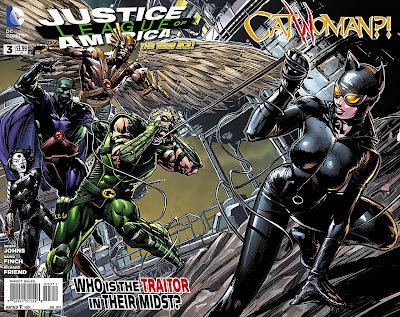 In a delayed-from-last-month issue (thus the gatefold cover) we see the JLA attempting to infiltrate a secret society capable of creating advanced, dangerous fighting robots! Obviously this threat to American security cannot stand, but how to learn more about this mysterious organization? 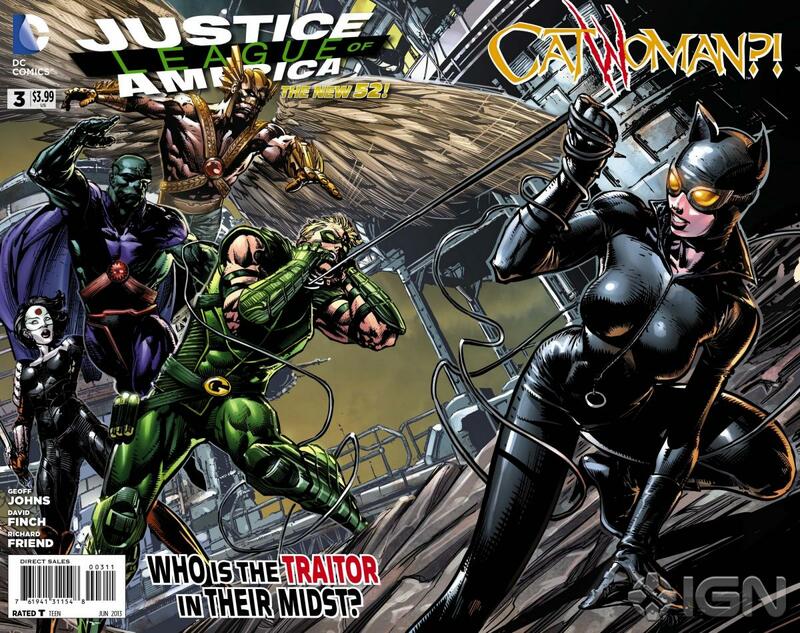 Steve Trevor and Amanda Waller have a plan...get Catwoman to figure it out! All they have to do is "capture" her and lock her up in Arkham...then she'll do the rest! Since you know, everything in the life of a superhero working for the government is just that simple...and infiltrating a secret criminal empire should be child's play for someone who routinely avoids Batman! Lots of cool character moments here, as we learn more about this team and the individuals that comprise it! Vibe, Stargirl, Katana, Martian Manhunter, Hawkman, Green Arrow...all have their moments! 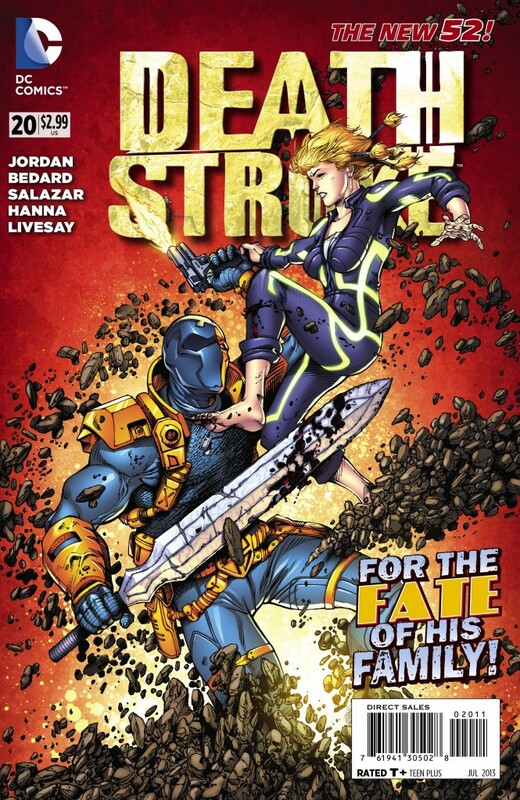 It's hard to juggle such a large cast but I feel like Geoff Johns is doing a great job teaching me more about who these people are while keeping the main story moving along! There's also a great little back-up feature that literally gets into the heads of Catwoman and Martian Manhunter! I hope they continue this with the other team members! Good work overall! New Comic Book d=Day again tomorrow! I'm looking forward to new issues of Batgirl, Wonder Woman, Nightwing and more! Happy Victoria Day Weekend coming up! It's a Canadian thing....Peace!